In 1874 James Mulligan encountered the Hodgkinson River, which he named after William Hodgkinson, mining warden at Etheridge (1870) and Queensland parliamentarian (1874). Two years later Mulligan, confident of finding gold along the river, set out on a further expedition. Miners from the Palmer River followed him there, and by April 1876 it was estimated that 2000 were working the river. In June that year the Hodgkinson Minerals Area was proclaimed. Returns were meagre, but optimism prevailed. By 1877 two towns had been formed, Kingsborough and Thornborough, each with a population of over 1000 according to the mining warden. Kingsborough, on Caledonia Creek, was named after Henry King, the MLA for Wide Bay and Secretary for Public Works and Mines (1874-76). Thornborough was named after his successor in that portfolio, George Thorn, MLA for West Moreton. Kingsborough and Thornborough, about 5 km apart, grew up almost overnight. By mid-1877 the mine warden reported that between them the towns had 20 hotels, 13 general stores and four butchers; Thornborough had two banks and two jewellers. Mining activities received a boost with the opening of the Cairns-Mareeba rail line in 1893 improving the area's accessibility and the advent of cyanide refining technology. Later, Thornborough acquired a courthouse, hospital, school of arts (500 volumes recorded in 1895) and a primary school. It was also the meeting place of the Woothakata local government board. The Woothakata Shire offices remained at Thornborough until 1919 when new ones were opened at Mareeba. The shire was renamed Mareeba in 1947. By 1913 three hotels remained in Kingsborough and two in Thornborough. Ten years later only Thornborough was a population centre, with several miners, a few tradespeople and just the Canton Hotel. In another ten years the post office directory recorded not one miner at Thornborough, and Kingsborough was not listed. 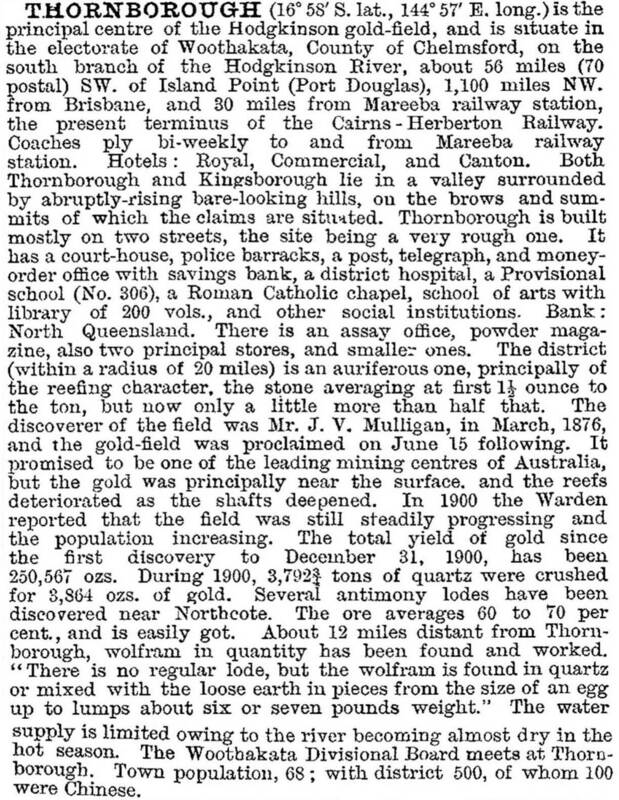 Quartz batteries and smelters needed fuel, and a railway line was opened in 1915 from the Mount Mulligan coal mines to the Cairns-Chillagoe line at Dimbulah. The line went to Thornborough, but by then the good profitable reefs had been worked out. The Mount Mulligan mine closed in 1958, outlasting the Hodgkinson gold field by thirty years. Considerable abandoned and derelict mine machinery remained, apparently escaping the attention of scrap dealers. Kingsborough is a rich repository of industrial heritage, with the old General Grant mine and winding plant and the Kingsborough battery (1896) listed on the Queensland heritage register. There were also deposits of antimony and wolfram found in the Hodgkinson Minerals Area. Queensland Heritage Register entry 600683, General Grant mine and winding plant. Queensland Heritage Register entry 600682, Kingsborough battery.